The study of adaptive evolution necessarily entails an exploration of how environment and genetics influence the connection between phenotype and fitness. In earlier work, I examined the functional (trait) and genetic basis of adaptation, focusing principally on developmental, physiological and life history traits in plants. In recent years, I have turned the question around to ask when and why adaptive evolution fails to occur. Indeed, the absence of ongoing adaptive evolution in many species is a striking, though often overlooked, feature of many systems. The setting for my current research is at the boundaries of species' geographic ranges. One of the fundamental questions in ecology and evolution concerns the causes of species distribution and abundance. Questions of organismal distribution fall within the purview of paleontology, biogeography, speciation biology and contemporary ecology and evolution. In addition, patterns of distribution can be examined at multiple spatial scales, from the edges of habitat patches at a local scale to the boundaries of geographic ranges at a continental scale. The geographic range boundary offers a particularly tractable spatial context in which to examine limits on distribution because a species is present on one side of the boundary but absent on the other. Barring dispersal limitation, one might ask why species do not continually evolve to new conditions and extend their distributions indefinitely. A second reason for my interest in range limits is to understand how species will respond to global change: will species they shift their distributions to track suitable habitat or will they adapt to changing conditions in their present locale? Even environmental tracking will often require some level of evolutionary adaptation because not all conditions are the same in the "new" range. I have been engaged in collaborative studies on the ecological and evolutionary constraints to range expansion (Vince Eckhart, Grinnell College; David Moeller, U. Georgia; Peter Tiffin, U. Minnesota), and, as a counterpoint, in work on spatial colonization patterns and adaptive evolution following range expansion in a native plant (Ania Wieczorek, U. Hawai'i). 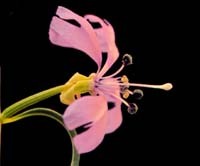 The first and largest study focuses on potential constraints on range expansion in Clarkia xantiana ssp. xantiana (pictured at right) in the southern Sierra Nevada of California. Four causes have been hypothesized to explain the location of range boundaries. First, the range edge may not be in equilibrium if a species has not yet arrived beyond its present boundary because of short-term or long-term colonization barriers. The spread of invasive species clearly illustrates the importance of dispersal barriers as a cause of prior range limits. The remaining hypotheses set aside dispersal limitation and focus on ecological and evolutionary causes of range limits; they are predicated on the assumption that abiotic or biotic environmental conditions deteriorate toward and beyond the range edge. Environmental deterioration gives rise to demographic limits: individual reproductive success, population growth rate, and population size are predicted to decline in adverse environments, such that edge populations are "sinks" which owe their persistence to immigration from central "source" populations. Following on the heels of demographic limits are genetic. First, small edge populations lack genetic variation because of genetic drift, low mutational input or strong selection to adapt to novel environments. Finally, range edge populations may fail to adapt because gene flow from the center to the edge introduces maladapted "center" alleles into edge populations. Our work focuses on characterizing environments and estimating demographic and genetic parameters. We have documented a strong gradient of declining precipitation from the center to the eastern edge of the range. The eastern range edge also corresponds to a geological fault that results in an abrupt change from granite to meta-sedimentary rock. Meta-sedimentary soils differ in texture and have lower matric potential than granitic sands (Eckhart et al., unpubl. data). These environmental changes translate into declining plant performance toward the eastern edge. At the same time, granite soils are present to the east of the fault, suggesting that the fault itself is not an insurmountable barrier to colonization, especially in light of the fact that the sister taxon to ssp. xantiana crosses the fault from the east. Pollinator abundance declines from the center to the eastern range edge and results in greater pollen limitation to reproduction in some years. Herbivory on fruits, by contrast, is highest in the center and lower at the eastern edge of the range. These results that suggest that pollination but not herbivory may constrain range expansion (Moeller & Geber, unpubl. data). Our demographic studies show that yearly seed output per population and year-to-year population growth rates, which are generally < 1, decline toward the eastern edge in some years. Furthermore, most populations "extinctions" occur at the range edge (Geber et al., unpubl. data). The fact that population growth rates rarely exceed one suggests that populations throughout the range can only persist if there are dormant viable seeds in a soil seed bank. To measure seed viability, we are conducting studies of buried seeds, a subset of which are removed after 1, 2 or 3 years (Geber et al., unpubl. data) and we are also estimating the size of the seed bank. To test the hypothesis that range edge populations are depauperate in genetic variation, we have established a reciprocal transplant experiment in which full-sib families for six populations are planted in their home site and sites in other regions of the range, as well as beyond the range edge. This design allows us to assess whether genetic variation and co-variation in phenotypic traits and fitness components is lower overall in edge populations or whether the expression of genetic variation is reduced in the marginal habitats at the eastern edge and beyond. Finally, we are estimating gene flow between center and edge populations and assessing historical relationships among populations (Tiffin, Moeller & Geber, unpubl. data). We have also created F1 and backcross hybrid genotypes between center and edge populations to test the hypothesis that gene flow from center to the edge compromises fitness at the range edge (Moeller et al. unpubl. data). As a counterpoint to the previous study, I have looked at spatial patterns of range expansion, and adaptive evolution during colonization, in Solidago sempervirens, an herbaceous perennial that is native to dunes and marshes along the Atlantic and Gulf coasts and that has expanded ins range in the last 50 years in to the mid-Atlantic states and as far west as Chicago and southern Ontario along the southern edge of the Great Lakes. It has done so as a result of the use of de-icing salts applied to roadways in the winter. Molecular characterization reveals that native populations from Newfoundland to coastal Louisiana fall into four distinct genetic groups: Newfoundland to S. Maine (north); New Hampshire to Long Island, New York (middle north); New Jersey to Virginia (middle south); and South Carolina to Louisiana (south). At inland locations near the coast, populations are most similar to the nearest coastal counterparts, suggesting stepping-stone colonization. Further inland, populations are derived from either one of middle groups without regard to geographic location, indicative, perhaps, of "hop-scotch" colonization along roadways and railways (Wieczorek & Geber, in prep.). A common garden study of populations from coastal Massachusetts to central New York showed that coastal populations are no more salt tolerant than interior populations Ð inland populations are restricted to roadsides and salt seeps. Populations are differentiated, however, in flowering phenology in a clinal fashion suggestive of rapid adaptive evolution to new environments as populations established further inland. Specifically, flowering time occurs earlier in the most inland populations where the climate is more continental (Brauer & Geber 2002). Study of the linkage between species diversity and community change vs. genetic diversity and evolution within species offers a platform in which to explore co-varying ecological and evolutionary dynamics. We have a lot of empirical evidence on the influence of biotic interactions on patterns of natural selection and adaptation within species. There is some work on the effects of genetic variation within species on community structure, but very little on the effects of evolution within populations on community structure and change. In the future, I plan to pursue work and welcome graduate students who are interested in the latter area of research. I have had a long-standing interest in plant-pollinator interactions and plant mating system evolution. Currently, I am involved in two collaborative projects in this area. The first is with Drs. Ruben Alarcon (Carl Hayden Bee Research Center, USDA Lab, Tuscon, Arizona) and Judith Bronstein (University of Arizona) on community-level patterns of plant-pollinator interactions in the Sonoran desert. Second I am a participant in a workshop initiated by Drs. Susan Kalisz (University of Pittsburgh) and Mark Johnson (Dalhousie University) and sponsored by the National Evolutionary Synthesis Center (NESCent) on the causes of mixed mating (outcrossing and selfing) in plants (see also, the pollination work under limits to range edges). Dr. Ruben Alarcon and I characterized whole community-level networks of plant pollinator interactions in a Sonoran desert community over two years (Alarcon et al., unpubl. data). Although plant-pollinator relationships have been well characterized for particular plant species, patterns of community structure have recently become the focus of pollination research. Our first goal is to describe specialization vs. generalization in resource use by bees and plants. Specialization vs. generalization is also being quantified through analysis of plant species diversity in the pollen loads of bees collected in the field. The data will allow us to analyze the structure of the network of plant-pollinator interactions at the community level. The second goal of this project is to examine one potential cause of patterns of visitation and network structure, namely a matching between the morphology of bees and the flowers they visit. Our workshop entitled "The Paradox of Mixed Mating in Flowering Plants" addresses the question of why so many plant species exhibit a pattern of mixed outcrossing and selfing. Most theoretical models predict that species should evolve toward complete selfing or outcrossing, depending on the genetic transmission advantage of selfing vs. the disadvantage of inbreeding depression. Participants in the workshop are developing models that identify the evolutionary circumstances that favor a mixed mating system (Johnston et al., in press; Porcher et al., in review) and empirical methods for evaluating the evolution of mating systems in the field (Eckert et al., in review). Other papers that will ensue from the workshop use a database of mating system estimates across flowering plants to: (1) examine relationships between floral and plant morphology and ecology and mating system; and (2) the relationship between outcrossing rates and inbreeding depression across taxa.